The ancient Athenian legal system is both excitingly familiar and disturbingly alien to the modern reader. It functions within a democracy which shares many of our core values but operates in a disconcertingly different way. Trials from Classical Athens assembles a number of surviving speeches written for trials in Athenian courts, dealing with themes which range from murder and assault, through slander and sexual misconduct to property and trade disputes and minor actions for damage. The texts illuminate key aspects both of Athenian social and political life and the functioning of the Athenian legal system. This new and revised volume adds to the existing selection of key forensic speeches with three new translations accompanied by lucid explanatory notes. The introduction is augmented with a section on Athenian democracy to make the book more accessible to those unfamiliar with the Athenian political system. To aid accessibility further a new glossary is included as well as illustrations for the first time. 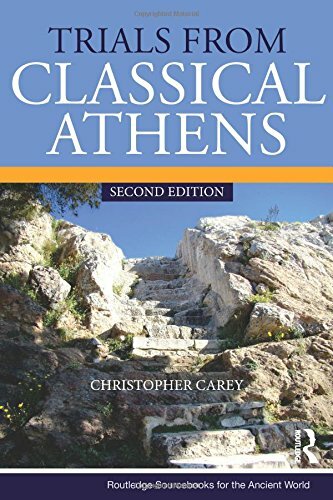 Providing a unique and guided introduction to the Athenian legal system and explaining how the system reveals the values and social life of Classical Athens, Trials from Classical Athens remains a fundamental resource for students of Ancient Greek history and anyone interested in the law, social history and oratory of the Ancient Greek world.